This is the question The Economist asked over two years ago in its cover story on June 8, 2013. 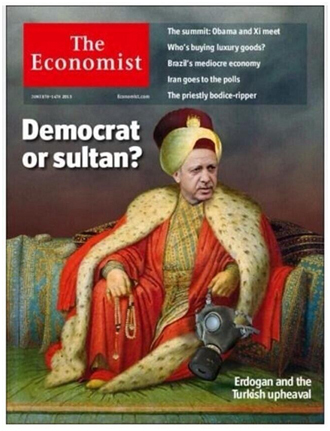 It’s become clear since that Turkish President Recep Tayyip Erdogan’s intention is to be another Ottoman Sultan. Turkey’s elections this Sunday, Nov. 1, may see his goal is realized. This map – published in the London Daily Mail yesterday (10/28) – shows the origins and extent of the Moslem invasion of Europe this year – 680,000 so far with tens of thousands more on the way. 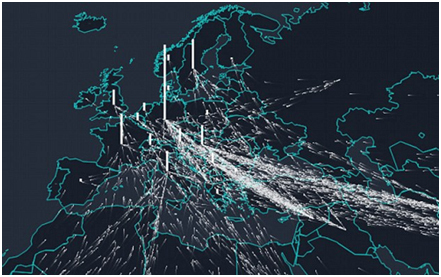 It’s easy to see the conduit of the hordes from Afghanistan, Iraq and Syria is Turkey. This is no accident, Comrades. Erdogan (air-doh-wan) wants to achieve the great goal the Ottoman Sultans never could – the Islamization of Europe. When Angela Merkel masochistically opened Germany’s borders and welfare state to Moslem “migrants” and “refugees,” he saw his chance and seized it. Turkey is a member of NATO – the North Atlantic Treaty Organization, a military alliance formed in 1949 between the US, Canada, and Western Europe created to oppose Soviet imperialism after Stalin’s seizure of Eastern Europe. Turkey along with Greece joined in 1952 to prevent their colonization by Moscow. But the Soviet Union is no more, so why does NATO continue to exist? It probably wouldn’t by now had Russia abandoned and apologized for Communism in the way Germany did for Nazism. Germany just didn’t mouth the apologeum, it abandoned Nazism in its soul, and is thus, again, part of the West, a genuine ally of ours. But Russia never did. The founder of the Soviet Union, Lenin, still lies displayed in a tomb on Red Square reverentially visited by millions. Russia is led by a KGB officer who dreams of re-imprisoning former Soviet colonies, and has actually done so in parts of Georgia and Ukraine. As a result, every Eastern Europe country once freed from the Soviets asked to join NATO to protect themselves from Moscow. Albania, Bulgaria, Croatia, Czech Rep., Hungary, Poland, Romania, Slovakia, and Slovenia are all NATO Members now. The only exceptions are Balkan remnants of Yugoslavia. Montenegro and Macedonia should receive membership this December. Bosnia remains in turmoil and unconsolidated, while Russia-aligned Serbia remains the only holdout. In addition, the three Baltic states of Latvia, Lithuania, and Estonia – once colonies actually within the Soviet Union itself – are firmly ensconced in NATO. There are now 28 Member States of NATO – and only one is Moslem: Turkey. The Turkey created by Attaturk out of the ashes on the Ottoman Empire after WWI was MINO as well. Attaturk saw Sharia Islam as an atavism, establishing a secular government with a clear separation of mosque and state. Under Erdogan, Turkey has been rapidly becoming an Islamofascist dictatorship – and the elections on November 1 may cement it. He launched his career as Mayor of Istanbul in the mid-90s, then formed an Islamist party (Justice & Development – AKP) which won enough seats in Parliament to make him Prime Minister for 11 years: 2003-2014. Then he engineered his election as President, placed a stooge (Ahmet Davutoglu) as Prime Minister, reduced the Parliament to a rubber-stamp Roman Senate under the Caesars, and began ruling as a Sultan – an Islamofascist Sultan. All the speculation about whether Erdogan’s AKP will win a majority of seats on Sunday is irrelevant. Erdogan has built himself the most gigantic Sultan’s Palace where he lives in Oriental Potentate Splendor – and has offices for nearly 3,000 bureaucrats controlling every agency of the government. Who needs Parliament, their debates, their laws? He’ll rule Turkey all by himself by executive decree. Zero must be very jealous. But maybe not for long. The reality is that Erdogan is running Turkey straight into the ground. One primary reason is the extraordinary ethnic and religious diversity within the 75 million people in the country. Erdogan wants to impose his dictatorial version of Sunni Sharia Islam upon them all… not gonna happen. Ever heard of the Whirling Dervishes? Sure you have, but do you know who they actually are? They’re a branch of Sufis called Mevlevis, based in Konya. I was in Konya some years ago and met a number of them. They are very far removed from orthodox Sunni Islam. Even more removed are the Alevis with whom the Mevlevis have a number of connections. They’re supposedly Shia, sorta like Sufis, don’t pray in mosques, look upon the Koran as badly flawed – and they make up at least 25% , over 18 million, of Turkey’s entire population. A lot of Alevis will get elected to Parliament on Sunday. Then there are the Kurds. There are more Kurds than Alevis – over 20 million – and they, unlike Alevis, are not Turks. Kurds are the original inhabitants of Turkey who have lived there for many millennia – their capital of Irbil is over 7,000 years old. Turks are newcomers from Central Asia, arriving about a thousand years ago. Kurds are Sunni MINOs and are rapidly re-embracing Zoroastrianism, their original religion before Islam was forced upon them. One reason is Erdogan has embarked on a even more repressive policy towards Kurds than previous Ankara governments. Another is that for some time now, Kurdish women have been having babies over twice as often as Turkish women – so it won’t be long before half of Turkey’s military age population will be Kurdish. There will be a lot of Kurds elected to Parliament on Sunday as well. Add to this the millions of secular Turks who still revere Attaturk and want no part of Erdogan’s Radical Islam. These are all centrifugal forces that may well tear Turkey apart – literally. Rather than Erdogan being an Islamofacist Sultan of a reconstituted Ottoman Empire, he may preside over the dissolution of Turkey unable to retain its present borders. He’s well aware of this quite possible future, so you’d think he’d back off and take his country off the boil. But no, he’s a Moslem fanatic and megalomaniac as well – a real bad combo. So he attacks Europe with an invasion of Moslems instead. And who knows – given that the place is run by sniveling spineless masochistic Euroweenies, his invasion may work, Europe gets Moslemized, and Erdogan ends up hailed by history as one of the Great Heroes of Islam. It’s obvious what to do. The invasion has to be stopped and the invaders sent back to fellow Moslem countries in the Middle East that can take care of them. Obviously. Further however, Turkey’s membership in NATO has to be either rescinded or at the very least suspended. There is no justification for an Islamist Fox in the NATO Henhouse. Erdogan has transformed Turkey into an enemy of Europe, of the West, of Christendom if you will. It’s a tragedy, for Turkey is a wonderful country where I’ve spent many memorable times, full of wonderful people who have no desire at all to be anti-West. They want instead to be allies and friends with us. Erdogan and his ilk are a cancer metastasizing in Turkey. Let’s hope the Turkish people take the first step in excising the cancer this Sunday – and do what it takes to get rid of it in the months to come. — The Islamist in Europe’s Henhouse was originally published at To The Point News.